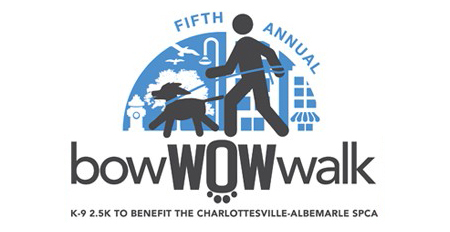 Sign up for the 5th Annual bow-WOW-walk! This K-9 2.5K supports the animals and lifesaving programs of the Charlottesville-Albemarle SPCA. Two-legged and four-legged fun-seekers alike will be delighted by this walk and festival. The walk begins at IX Art Park and winds through Charlottesville’s historic downtown mall before returning to IX Art Park, where a post-walk festival will WOW our doggie friends! Enjoy human and doggie entertainment, canine competition, treats for pups, and a pack of animal-friendly sponsors.